The kittens wanted her, I said. Later that week a man unloaded a steel trap into the front yard. A very hostile orange cat erupted out of the trap, up the man’s arm, over his head, leaving a trail of blood as she leaped down to the ground and streaked away into the woods. Later that day the kittens persuaded their mother to be reunited with them in the barn, and came in full of milk, purring and content. The feral mother cat would try to sneak bites of leftover food when she thought I wasn’t looking, but would not eat food that was set out for her. “Silly yellow wild cat,” I observed, and, thinking of an old children’s storybook, called her Liza. In between the arrival of Bounce and Pounce and the arrival of their mother, on a job site I’d met Graybelle, the Third Queen of the Cat Sanctuary, also feral. For the first week or two Liza slapped and scolded Graybelle. Though Graybelle had kitten teeth and was still growing fast, she was already as big as many female cats get. Liza was an impressive “Big Mamma,” usually mistaken by strangers for a tomcat, and not to be impressed by Graybelle’s size. Not yet. Over the course of the winter, although Liza was mostly dense muscle and solid old bones, and Graybelle was mostly fluff, the size difference gradually reversed. Then Graybelle went on growing, being one of those Manx cats who revert to the full size of their wild ancestors. Bounce and Pounce were the cuddly pets who did cute things and wanted to be held. Graybelle was gentle but not affectionate. Liza gradually, week by week, let her kittens persuade her to eat with them. I didn’t try to force Liza to be a pet. I set out food for Bounce, Pounce, and Liza in one bowl, food for Graybelle in another bowl. Bounce and Pounce would eat a bit and then want to play and be petted. It was amusing to watch Liza approach and avoid, approach and avoid, over the winter. She liked kibble and loved fish. After a month or two she’d even let me stroke her back while she was eating. One snowy day I sat on the porch and watched everyone eat, and Liza came close enough for me to pick her up and hold her on my knee. She didn’t scratch or bite; she froze. When rubbed behind the ears she emitted an extraordinary noise. It was a sort of purr, but a high-pitched, more panicky than contented purr. She seemed unable to believe that she was being petted by a human and…liking it? Then a strange voice was heard from the road. Jehovah’s Witnesses were out making themselves tiresome. Liza retreated into the woods again. She was back in the yard for dinner, though, and now a new social dynamic appeared. Management of the humans is a point of social status for cats. Graybelle had been very dignified and ignored Liza once they were about the same size–but now Graybelle was bigger, with status to maintain, and she didn’t like Liza. If I picked Liza up again, when I set her down Graybelle would slap her. Liza continued nursing her kittens all winter. People who dislike cats will tell you that if cats aren’t sterilized they’ll have two or three litters every year. Actually I’ve only ever seen oversexed adolescent cats have two litters in a year. Mature female cats practice birth control primarily by nursing kittens for six months, which normally inhibits ovulation. Cold weather also normally inhibits ovulation, so nursing met an emotional need more than a survival need for Liza, Bounce, and Pounce. By March, Liza had lost her fear of me and acted like a pet when Graybelle wasn’t watching, though she avoided me when Graybelle was watching. 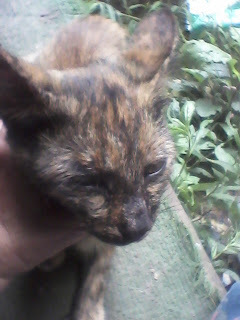 Then, since she was still feral, she eloped and I never saw her again. Maybe she moved in with her mate’s family and became Queen. It’s hard to say. A lot of cats look like Liza. Liza was one of nine feral-born cats who’ve become pets, even indoor pets, with some encouragement from me. (Only six of them were my pets; Graybelle, Boots, and Muffin were definitely other people’s pets who also recognized me as a friend.) People who listen to Humane Pet Genocide Society drivel have heard that feral cats can’t become pets. I say: bosh. Feral cats do not have the neurotic need for human supervision that some pet cats do. They know they can survive on their own, which makes it all the more rewarding that they often will choose to bond with humans who respect them. Would you love someone who trapped you, kept you in a steel cage, separated you from your home and friends, performed unnecessary painful surgeries on you, either held you prisoner or dumped you out on a street corner while you were still bleeding from a major surgical operation? Feral cats don’t love the people who carry out Humane Genocide Society mandates on them, either. That does not mean that feral cats never bond with humans, but it does reduce the chance that a feral cat will ever learn to trust another human. Would you, on the other hand, love someone who shared food with you, helped you recover when you were in fact sick or injured, helped keep insects from eating you alive, helped baby-sit your children, and protected you from predators? Feral cats often do learn to love the people who help them, too. Be respectful, don’t make a feral cat a prisoner, and it will be your friend. This Morguefile cat (Gracey at www.morguefile.com/archive/display/232313 ) is one of thousands of cats, mostly male, who look like Liza. Here’s a revised, updated, human-to-human version of an article previously published in the “animal interview” form. Question: How do Cat Sanctuary cats get their names? Answer: Sometimes from their colors. Sometimes from the way they behave. A few cats’ names have been inspired by books. Liza, a feral orange female, was so scared of me at first that she reminded me of the story in Lazy Liza Lizard with the song about the “silly yellow wild cat.” The combination of Iris, Irene, and Ivy came from Piers Anthony’s Xanth comedy series. Some cats were named in combinations. There was a blue-gray kitten called Grayce, and later her pale orange half-brother was Paley. Polly was polychromatic; her granddaughter, who was both polychromatic and polydactylous, was Candice. Princess Anne, the elder sibling, and Mitchellville, the younger smaller sibling who quickly grew bigger, were named after two towns in Maryland that developed in a similar pattern. I never found out the real name of a frequent visitor who became a resident after his human died, but since he first came to visit Graybelle I called him Graybeau. The Cat Sanctuary was really founded by a cat called Magic who had a penchant for adopting kittens. Magic was a present from a NASCAR promoter, and several of her family had NASCAR-theme names: Black Magic, Black Velvet, Kulwicki, et al. NASCAR names were reserved for kittens with very loud purr “motors”—Magic was one, and raised several. Some Cat Sanctuary cats were named by other people. I didn’t think of “Graybelle,” although I like it. Harley and Davidson were “Manx One” and “Manx Two” while growing up at the Cat Sanctuary—it wasn’t as if they were the sort of cats who came when called. Q: Do cats care what they’re called? A: Some of them really seem to care. For Minnie, a tiny kitten who grew up to be a big fat cat, I think the transition had to do with the trauma of being spayed. As a kitten she answered to “Minnie Mouse” or “Bare Minimum.” Around the time she was spayed, names suggesting small size started to seem ridiculous, so I started calling her plain Minnie. She never answered to “Minnie.” She became wary of being called. Of course most cats don’t listen to humans enough to know that they have names. Even when they do consistently answer to their names it’s not always clear whether they’ve absorbed the concept of a specific sound meaning them. Often at the Cat Sanctuary I’ll call the senior cat first, and all the others form the habit of coming when I call the Queen—or in Mac’s case the King. It can take them a while to figure out that they have separate names of their own. They don’t necessarily realize that other humans know their names, either. Magic always responded when other people said her name, but Minnie would hide in the cellar when almost anyone else spoke at all; she liked one volunteer who came here to feed her, but not others. Cats can also have a hierarchy among themselves. Sometimes one cat will start to answer to a name, and another cat will chastise it, as if to say “My human wouldn’t want to call you.” In order for those two cats to live with each other, the subordinate cat won’t answer to its name or be much of a pet as long as the dominant cat’s about. Some cats even divide up the humans: this one’s yours, that one’s mine. Q: What guidelines have you learned about naming cats? A: (1) Give them names that you believe are good names. Some cats do sense what a name means to you. I’m sure Mogwai always understood me to mean “something that’s ugly in a cute, amusing way” by her name. Once a visitor asked whether “Mogwai” was “some sort of devil name,” and Mogwai sank all her claws in through his shirt! (2) If you want them to learn their names, choose names that don’t sound too much alike. Grayzel and Graymina were the same gray-hazel, pale-tortoiseshell color. I called both of them “Gray” interchangeably. Until Graymina left the Cat Sanctuary I had no idea that Grayzel heard words. (3) If they’re registered with long, extravagant “official names,” shorten those names to something suitable for calling around the house. (4) Avoid giving a cat the same name you actually use to call a human. Some humans find this offensive, but even if the human likes it, it confuses the cat. (5) Call the cat by name when you want to pet or feed it, and just grab it, without calling it, when you want to take it to the vet. This picture of my cat Ivy was taken when Ivy was about a year old. (Irene is sitting behind her, pointedly waiting for Ivy to finish smearing happy-cat pheromones on my hand.) Ivy looks a little more mature now, but she’s still a small, slim, very young-looking cat. Ivy’s mother was Heather’s and Irene’s grandmother, so properly Ivy is their aunt not their sister. Ivy is, however, a few days younger. The year the calico divas were born, poison was sprayed along the sides of Route 23, half a mile away from the Cat Sanctuary. I’m not sensitive to all herbicides; this particular one choked me up with respiratory allergy reactions. The cats didn’t have that reaction right away, but one of Ivy’s siblings died. Ivy’s mother then brought her three surviving kittens to her daughter and integrated the litters. Then Ivy’s brother, then her mother, and finally her sister died. Ivy’s mother must have eaten something poisoned. Ivy worried and grieved over her family but, luckily, her nieces accepted her as a foster sister. As a result of this early loss Ivy is the only one of the calico divas who’s ever seemed to relate to me as a mother figure. Her role in the cat family seems to be the communicator. Ivy is one of a small minority of cats who learn to recognize human words as well as dogs, birds, or horses do. I’ve seen her watch and listen when I offered a kitten a name that it seemed to accept, then nudge the kitten to respond to its name if the kitten didn’t remember its name later on. All kittens born after Ivy have answered to names. When last year’s kittens were very young I took them outdoors and snapped their pictures. Gwai, the timid neurotic kitten, seemed too panicky even to sniff at the ground or stare at the camera. Ivy came out and nudged Gwai to watch her, then got in front of the camera and posed. Gwai calmed down and acted like a normal kitten, and everything ran smoothly. Those buff eyebrow markings stand out and allow Ivy to use “facial expressions” to communicate with me. She has “looks” that mean things like “Let me show you something” or “Somebody is watching you.” If Ivy makes any mental distinction between strange humans, strange dogs, or strange deer, I don’t know how she expresses that distinction, but on general ideas like “Somebody is watching” she’s reliable. Ivy has never been spayed. One year she had kittens. Then she bonded with a neutered male, and since then she’s spent lots of time with him and produced no kittens. Being a social cat, she enjoys baby-sitting other cats’ kittens; one year she adopted a litter, and this year she’s nursed Heather’s and Irene’s kittens. Here’s Irene, the “big Mama” at the Cat Sanctuary, photographed when she was about a year old. She’s grown bigger, of course, but this is still what she looks like. On some cats that soulful gaze might mean “Is it dinnertime yet?” On Irene it usually seems to mean “Why must you be so clueless?” and often appears when Heather and Ivy succeed in getting my attention first. In some ways Irene is one of those pets who suffer by comparison. 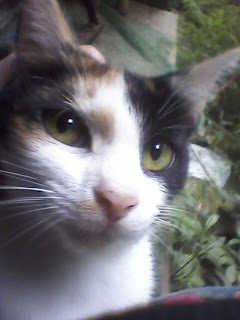 She’s smart, in some ways the smartest of the three calico divas–the one who usually stays indoors and minds the kittens. She recognizes some words, though probably not as many as Heather or Ivy. She demands less attention than Heather and Ivy demand from me, and soaks up more attention from kittens. The others rely on Irene to be the homebody. I’m fond of Irene, but, as the good, sweet, dutiful homebody in the family, she can be overlooked while Heather and Ivy have their dramas and adventures. Because I’m fond of Irene I didn’t want to see, and wasn’t pleased to see, that she’s a carrier of the Manx gene. She has a complete tail, but not a very long one. She’s not much of a hunter or climber. I don’t let animals become obese, but Irene does put on fat much more easily than her American Shorthair and Siamese mixed relatives ever could. In winter I’ve had to limit her food rations. 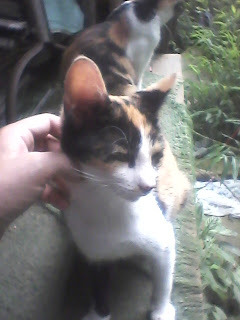 In summer, she’s not a fat cat at all, but her bones are wider and heavier than her sisters’, and her coat is fluffier. These are Manx traits. Irene, who shows no Siamese traits, has been with a Siamese tomcat and produced Siamese-colored kittens with stubby tails. I believe lethal genes should be bred out, not in. I believe Manx cats should be sterilized. From time to time local busybodies have tried arguing with me about having my resident cats sterilized. I think the world needs more social cats, and welcome the Patchnose Family’s kittens. I’ve also watched Irene grieve when her own kittens died, then find consolation in mothering Heather’s kittens. So for the past year or so I’ve been telling the busybodies that if they’ll contribute the money, I’ll let Irene be spayed. This has at least silenced the busybodies. The thing is that, although no cat enjoys having major surgery, Irene seems less likely to miss having kittens than any other mother cat I’ve known. So far as I can tell, her very favorite thing to do is to play foster mother to someone else’s viable kittens. Social cats rear kittens communally and Irene absolutely adores baby-sitting. Since I’ve been using Morguefile cat pictures to sign off when I needed to feed some sort of graphic to the Google + monster, some people have asked whether those are my cats. They’re publicly shared photos of cats I’ve never met in real life. I’ve posted photos of my cats on Blogspot and Persona Paper. Why not post them here, too. This is an early picture of Heather, taken when she was about a year old. It accurately shows her evenly distributed, “heathered” mix of black, orange, and creamy white fur, and very dark amber eyes–one could almost say brown eyes. It does not show her extra toes. Heather has a big inner “thumb” toe on each forepaw, for a total of six toes per paw. The thumbs look as if they’d be opposable; they’re not. When she was young her extra, non-opposable thumbs looked as if they got in her way. By now she’s a big strong tough hunter cat. Heather is a descendant of some cats who were rescued from an alley in Kingsport, Tennessee. Other remarkably clever and social alley cats have been found in Kingsport, some even in Humane Society shelters where their bloodlines were destroyed. Kingsport’s social cats seem to be a mixed lot. Some have semi-long hair, some show Siamese traits, and some have non-Siamese partial albinism. Mine are the Patchnose Family, named after their short-lived ancestor from the alley, who was feral but learned to answer to the name “Patchnose.” Heather is a direct female-line descendant from Patchnose. As a kitten Heather was the smallest and quietest in the litter. With her dark coat, she tended to fade into corners. She wasn’t even cuddly. She showed no signs of future Queenliness. Her sister Iris was by far the biggest, boldest, apparently the cleverest, the most charismatic, and the most dominant kitten, until their first winter, when Iris picked up an infection and stopped growing. When Heather, Irene, and even Ivy were adolescent cats and Iris was still a kitten for all practical purposes, Iris formed some antisocial behavior patterns and had to leave the Cat Sanctuary, and Heather stepped forward to become the Queen. For cats, control of their humans is a status symbol. (Sometimes bad behavior is a way of showing other cats what the alpha cat can get away with. Sometimes unfriendly or un-cuddly behavior toward you is a way of showing other cats that a beta cat isn’t disputing their claim to own you.) Although she wasn’t a cuddly kitten, Heather is an affectionate cat who runs to meet me when I come home. Often she keeps everyone waiting for dinner while she soaks up attention and tags me with that special happy-cat scent humans can’t consciously smell. “You don’t think your cat likes you?” Oh, I’m sure Heather does like me, though I’m also sure she’s never confused me with either her mother or her babies. I’m also sure that a purr-and-cuddle session with the three calico divas has at least as much to do with status as it does with affection. I enjoy it, and they enjoy it, but Heather’s insistence on being stroked first and/or most often is the way we know she’s our Queen. At my Blogspot, this vintage post seems to be attracting a lot of visitors. I’d add one minor update. Since 2011, the kittens born to Cat Sanctuary cats (Heather, Ivy, and unfortunately Irene) have grown up indoors. Just about all kittens spend the first six weeks of their lives indoors, usually in a small dark cave or a small dark corner behind a large stored object. Heather and Irene have chosen to allow me to see their babies from birth on; Ivy, more traditionalist, has chosen to hide them behind the dead refrigerator for the first six weeks, and then there was a non-resident litter Heather and Ivy helped to rear and socialize, in the woodshed, in autumn. (Ivy induced lactation for them, too.) And Irene prefers to hang out indoors. But it’s still the cats’ choice that they’re porch and mud room cats more than real barn cats. They’re not confined. Belated note in observation of Black Cat Appreciation Day, which was Monday but can be celebrated belatedly if you’re going to adopt a cat: Jean Craighead George, the naturalist and friend to feral cats, observed (wow, I have the collectors’ edition!) that some cats have what may function as illusive “eyes in the back of their head”–patches of thinner and/or lighter-colored fur on the backs of their ears, which may work like insects’ “eye spots” to confuse predators. I hadn’t really noticed that effect, in all these years, until our little Imp (the black kitten in the April Fools’ Joke combined litter) came along. She never was really solid black–had a few random individual white hairs, a pale grey undercoat, and pink-white skin from birth. As a half-grown kitten, she has more scattered white hairs in her fluffy outer coat, and the pale undercoat is growing thicker and more noticeable. Having the black fur gene from Heather and the Siamese-type partial albinism gene from her father, Imp might be described as the darkest blue-grey cat you ever saw rather than a true black cat…but she still basically looks black from a distance. Except for her ears, which have a few long, silky black hairs sticking out from the furry part of the insides, and patches where the white hairs are thick enough to form grey “eye spots” on the backs of the ears. She has my vote as the World’s Cutest Kitten. And does she ever know it. No, she’s not available for adoption. I’m strictly bragging…and urging those who are able to support a real cat sanctuary (hurrah!) or an ethically tolerable shelter (meh…if that’s what you have) to consider looking for a black cat, or dark-toned tortoise-shell or calico cat. They tend to fade into the shadows of a row of cages, but once they become pets they may have the very nicest purrsonalities–likely to be less wild than gray tabbies, calmer than orange tabbies, hardier than the albino types, quieter than Siamese, and more modest than calicos. Oh, well…regardless of color, any cat who loves you will be a great pet. But I started learning to appreciate cats with a black one. I want an avatar for this web site. The system doesn’t make them mandatory, but I want one. Back when I was “born” into cyberspace in 2005, nobody else was using the screen name “Priscilla King.” Now there are a couple of hundred of us on Google + alone; several of them insist that that’s their real legal name, in which case I think they shouldn’t be posting it on the Internet anyway. Anyway, if they don’t see a black cat with amber eyes, how will readers know I’m the first one to use this name in cyberspace? Fun part: go to Morguefile.com, search for “black cat,” check out the familiar and new cat pictures. Morguefile pictures are available for anyone to use. The site encourages users to “pay” for pictures we gank by donating pictures we’ve taken. I don’t think any of mine are good enough actually. Somebody’s added a new black cat image. 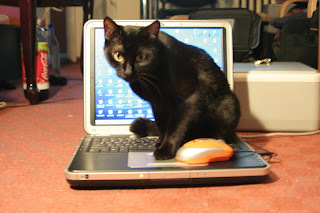 Cat playing with “mouse” on keyboard. Sort of like Viola the Cybercat (a friend’s kitten who contributed some comic relief to the Blogspot, years ago). Cute. Let’s upload it. Blogjob opens it as if it were exactly the same size it was before–not even Morguefile “magazine” size, but maybe the size of an extra-large centerfold. Much bigger than the computer screen. The part that shows up on the screen is a blur of pixels that doesn’t look like anything; on inspection it’s the far left corner of the original picture, not showing the cat or the laptop.